Although these stories were probably written by Joe Gill, he is not credited. 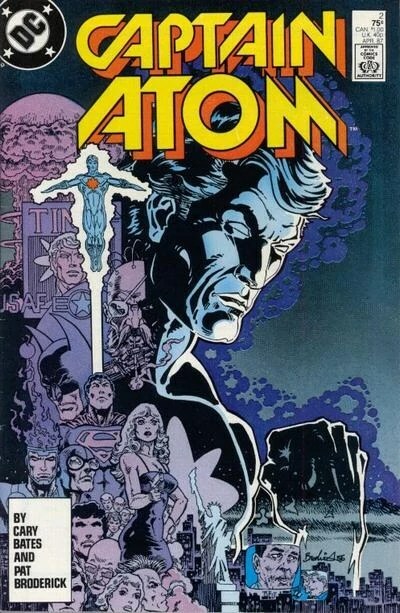 In the first story, Captain Atom has learned that a plane transporting a U.S. diplomat has been sabotaged to crash somewhere over the Atlantic Ocean. 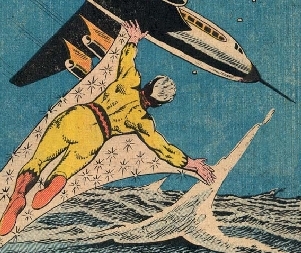 Cap comes upon the plane just as it is about to crash, and rescues the plane off-panel. 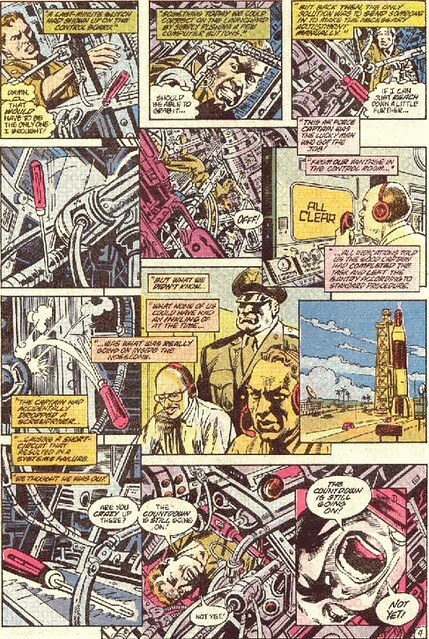 Captain Adam meets the diplomat on the ground, who tells Cap about the mysterious engine trouble that they had and his confusion on how they landed safely with no operable engines, even though he knows about Captain Atom. 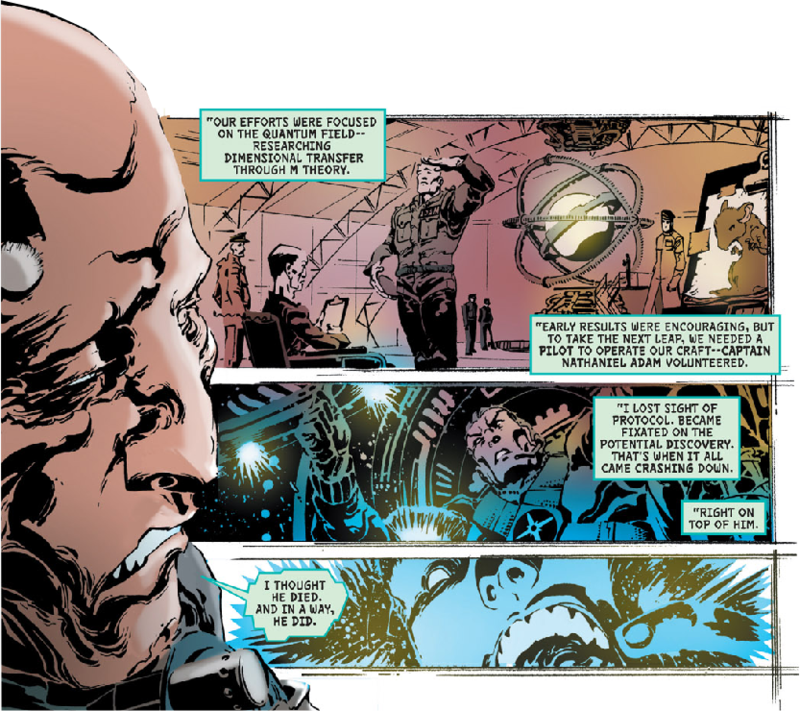 At the embassy, Cap does a little make-up work and assumes the identity of the diplomat (Mr. Haynes). He believes that “the enemy” plans to kidnap Haynes. Ten minutes later, he is proven right when a man posing as his chauffeur abducts the disguised Captain Adam. The kidnappers promise to get him to the conference, but that he’ll be delivering words they provide. At the conference, another diplomat (Malnov) accuses the U.S. of lying. He says they want an atomic war. When “Haynes” gets up to speak, he tells the other diplomats that he was kidnapped by Malnov’s men. The men open fire on Cap, but to no avail. 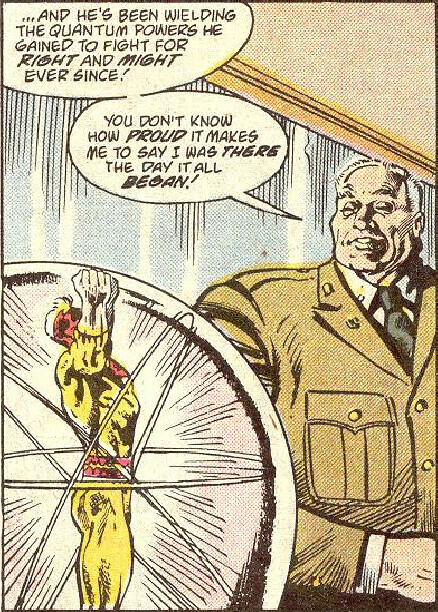 Haynes excuses himself for a moment (so Cap can switch back with the real Haynes), and when the true diplomat returns, he begins to discuss disarmament. Cap meets with Odeva, a double agent who tells him “they” have got a hundred atomic missiles ready to be fired (“they” must be the Russians). 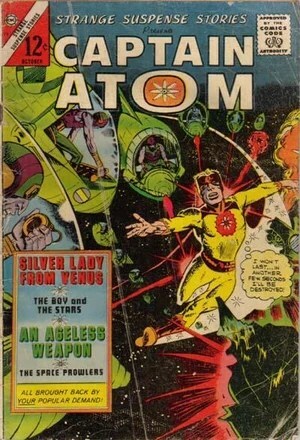 Captain Atom finds the missiles, prepping for launch. 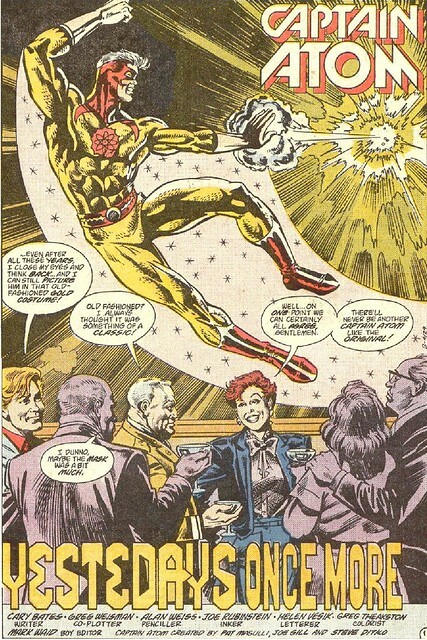 When they spot Captain Atom flying in, they launch the missiles, which Cap easily smashes. Again, this could have been a better story if it were longer. It is good for what it is, a B in my book. 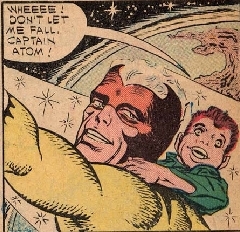 Ditko’s art is A material again, even though in the second panel it looks like Captain Atom is wearing an adult diaper under his costume. In this story we meet Master Sergeant Wilkie Scott, a man who was once an invaluable officer but has of late been making stupid mistakes. One of these mistakes was to launch nuclear missiles over major U.S. cities. 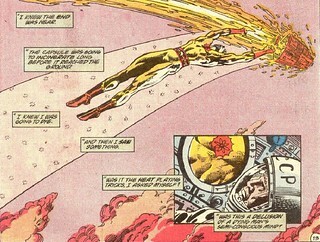 Captain Atom is disarming one over Manhattan in the opening panel. 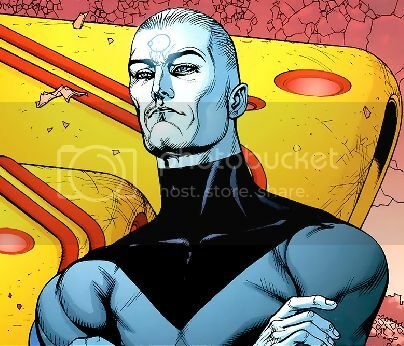 He rides the rocket out into space, saving millions of New Yorkers. Back at the base, we learn that Scott has been so distracted because his son is dying of gamma ray poison. Funny, gamma rays didn’t kill Bruce Banner. Adam approaches Wilkie. The two of them get in a jet and fly to Wilkie’s home on the West coast. They visit Wilkie’s son in the hospital. Adam asks the boy, Buddy, if he’d like to go into space. 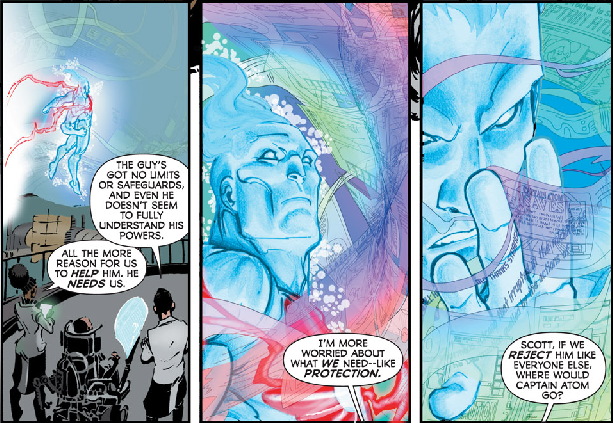 He becomes Captain Atom, who Buddy instantly recognizes and calls by name. 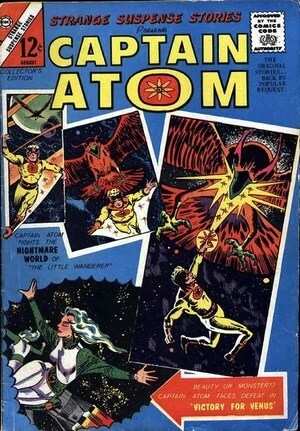 So, like in Space Adventures #39, Captain Atom is again a well-known superhero and not just working in secret for the Air Force. 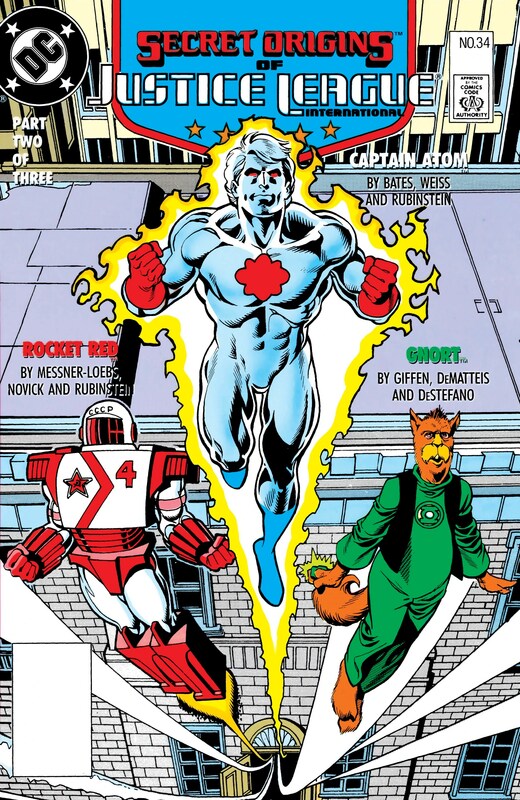 Captain Atom flies into space with Buddy, who the hospital staff think Captain Adam kidnapped. 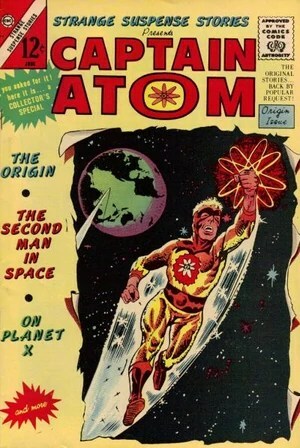 Of course, Wilkie Scott doesn’t panic, so he must know Adam is Captain Atom. Somehow, Buddy is not instantly killed when in the vacuum of space. Also, Ditko again displays his on-again off-again inability to draw realistic-looking children. The kid’s body is way too small and his mouth is way too big. I love Steve Ditko’s superhero art but he was hit-or-miss with kids. 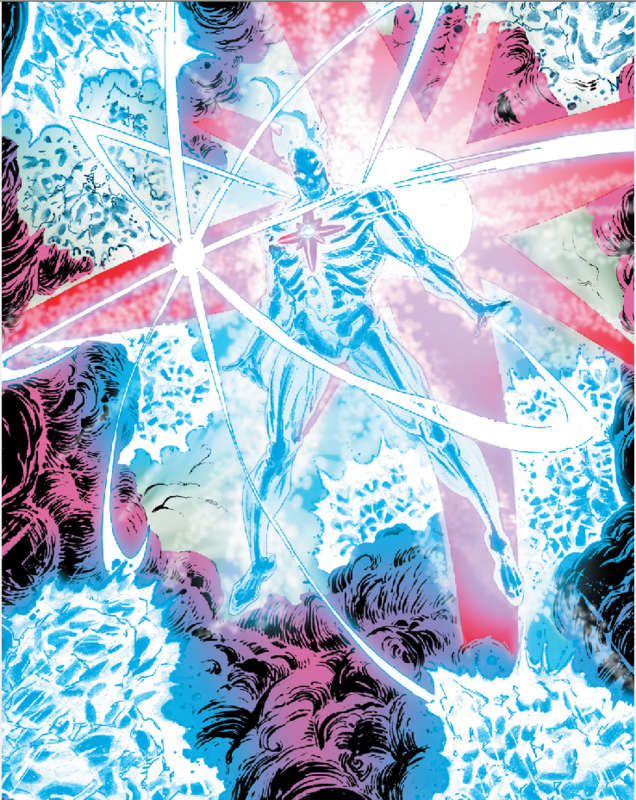 Captain Atom flies Buddy into “a lovely star that emanates a ray” that Cap has found useful in curing gamma ray poisoning. The two walk around inside the star for a bit. 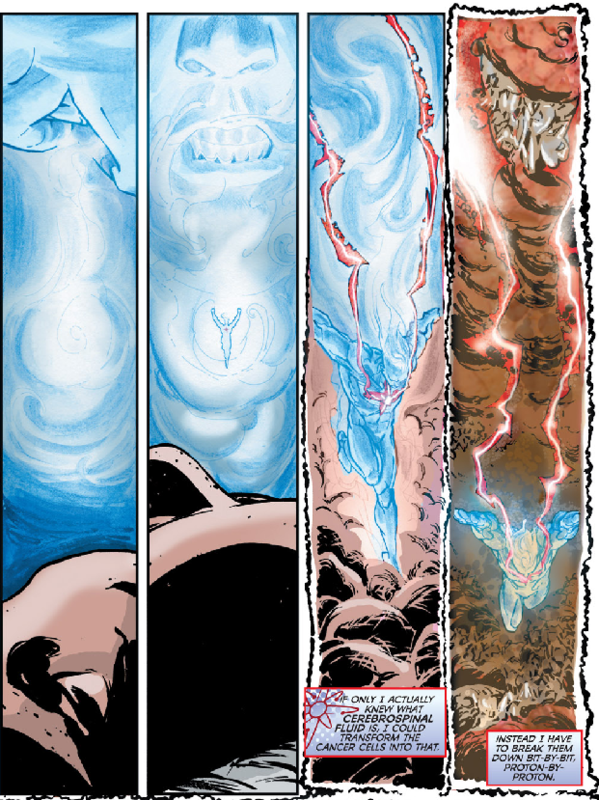 The Captain Atom takes Buddy on a sight-seeing tour of the Milky Way. Then Cap returns Buddy to the hospital, where he reveals he is completely cured. Later, we see a general chewing Captain Adam out for not dealing with finding out why the rockets misfired. Adam replies that he found out the cause and it won’t happen again. A cute story, but the science is weird. It is revealed that Buddy absorbed the deadly gamma radiation through his telescope. If that’s the case, why doesn’t this happen to people around the world all the time? And why didn’t Buddy’s head pop in space? A C story with C art (cause Buddy looks less like a little boy and more like a chimpanzee).